The Duke of Edinburgh has been spotted driving without a seatbelt in a replacement Land Rover - just 48 hours after his vehicle overturned in a dramatic car crash. Norfolk Police confirmed they had spoken to the duke after being made aware of photographs showing him driving without a seatbelt, saying "suitable words of advice have been given to the driver. "This is in line with our standard response when being made aware of such images showing this type of offence." The 97 year old was "seen close to Sandringham this afternoon...he was travelling alone wearing tinted glasses," tweeted ITV News Correspondent Emma Murphy. What are the rules for older drivers? The Queen was later also seen driving on a public road close to where the duke crashed. Buckingham Palace did not immediately comment on the sightings. ITV News understands from a source that, as is standard procedure, the duke "took and passed a police eye test" on Saturday. It came after one of the women injured in the car crash said she “always wanted to meet a royal – but not in this way”, it has been reported. 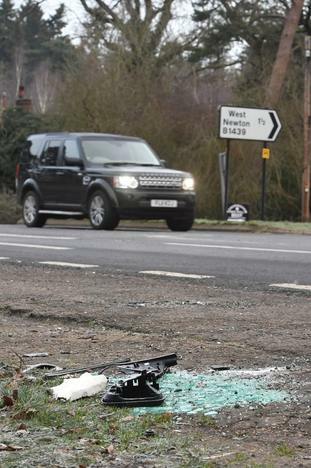 Prince Philip exchanged “well-wishes” with the two women hurt when the Land Rover Freelander he was driving rolled following a collision with a Kia, close to the Queen’s Sandringham estate on Thursday. A nine-month-old baby who was in the Kia was miraculously unhurt, police said. The 72-year-old from Norfolk told the paper: “The passenger from the other car told me, ‘I always wanted to meet a royal – but not this way’. She said the duke – who was found to have “no injuries of concern” after his check-up on Friday morning – asked about the welfare of the people involved in the crash. “I told him the baby was fine – but we thought the passenger had broken her arm,” she said. Despite his age and having had a hip replacement operation last year, Philip appears to have no lasting problems following the crash. Norfolk Police said two women – the 28-year-old Kia driver, who suffered cuts to her knee, and a 45-year-old passenger who broke a wrist – were treated at the Queen Elizabeth Hospital in King’s Lynn that day and discharged. The duke appeared to be travelling without a police protection officer, individuals who guard all senior members of the Royal Family when at public and private events.This may raise concerns about security but the duke was being shadowed by another vehicle, thought to contain police officers, just before his crash, Mr Warne has suggested. Norfolk Constabulary said in a statement: “As is standard procedure with injury collisions, the incident will be investigated and any appropriate action taken. Philip may have plans to continue driving as the Queen’s transport manager, Alex Garty, was seen at Sandringham as a new Freelander was delivered to the royal residence.